Freedom is not something that one people can bestow on another as a gift. They claim it as their own and none can keep it from them. Long before many of us were even conscious of our own degradation, Marcus Garvey fought for African national and racial equality. There is no solution to the race question until all forms of racial discrimination and segregation anywhere are made criminal. As a ship that has been freshly launched, we face the hazards of the high seas alone. We must rely on our own men, on the captain and on his navigation. And, as I proudly stand on the bridge of that lone vessel as she confidendy sets sail, I raise a hand to shade my eyes from the glaring African sun, and scan the horizon. There is so much more beyond. From our knowledge of the history of man, from our knowledge of colonial liberation movements, Freedom or Self-government has never been handed over to any colonial country on a silver platter. We face neither east nor west; we face forward. No part of Africa is free while any of our national territory remains unliberated. Africa is a paradox which illustrates and highlights neo-colonialism Her earth is rich, yet the products that come from above and below the soil continue to enrich, not Africans predominantly, but groups and individuals who operate to Africa's impoverishment. 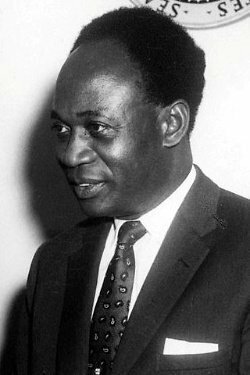 Bio: Kwame Nkrumah led Ghana to independence from Britain in 1957 and served as its first prime minister and president. Nkrumah first gained power as leader of the colonial Gold Coast, and held it until he was deposed in 1966.